Pavtube Video Converter for Mac is an excellent conversion tool for converting videos formats from one to another. With it, you can get FLV, MKV, VOB, M4A, TOD, and other formats file to meet your requirement of watching videos on portable devices. Pavtube Video Converter for Mac is designed to edit and convert video, audio, and images on Mac. 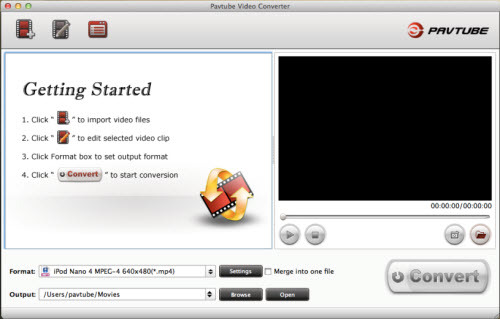 Different from other similar Mac converters, Pavtube video converter for mac supports a wider range of file formats such as Flash Video (*.flv, *.f4v), HD Video (*.tod, *.m2t, *.m2ts, *.ts, *.tp, *.evo, *.mkv, *.dv ), images like *.jpg, *.ico, *.bmp, *.png, *.gif, *.tiff , as well as the general video formats like AVI, MPEG, WAV and more. 2. De-compress the DVR (TiVo) files. 3. Due to the newest technology, its conversion process can save you a lot of time. 4. For better vision effect, the expert users can adjust the setting like bit rate, frame rate, resolution, etc. Depending on the function, you can find the most suitable parameters for your videos. 5. How to get the videos as expected? The editing function can satisfy you! You can trim the video to gain the time phrase you like, and crop the video to get your favorite image region. Moreover, you can choose a certain effect from the models like Gray, Aged file, Flip color and so on. 6. Add the image watermark and text watermark , even video watermark to make a unique video file for you. 7. Collect the attracting pictures in the video for collection on your PC by means of using the snapshot function. 8. Without complicate steps and superfluous clicks, you can view and find the converted video with just one click. 9. It supports ProRes, AIC, DVCPRO, DNxHD codec. Release Notes: - New presets for Apple TV Dolby Digital 5.1 audio pass-through. - Optimization to split operation and effect setting. - Now support 2D to 3D conversion by setting 3D effect in Video Editor panel. Pavtube DVD Ripper can rip DVD to AVI, WMV, for playback on portable players. Pavtube DVD Ripper for Mac is designed to rip DVD movies on Mac OS X. It supports to fast rip DVD to video formats including MP4, MOV, MKV, M2TS, M4V etc. for sharing on home media server or playback on iOS/Android/Windows Tablets and phones. Pavtube DVD to Gphone Converter is a professional Gphone converter. It can rip DVD to Gphone 3GP, 3G3 video, and ripping DVD audio to Gphone MP3 and AAC formats. With it, you can copy DVD movies onto your Gphone with perfect quality. Pavtube DVD to iPod Converter for Mac is specially designed to convert DVD to iPod supported files on Mac OS X. It supports to fast convert DVD to iPod supported file formats including MP4, MP3, AAC, M4A, WAV etc. Pavtube Video DVD Converter Ultimate is the most powerful multimedia conversion tool that includes two outstanding multimedia applications: Pavtube DVD Ripper and Pavtube Video Converter. It can perfectly rip DVD, convert all video and audio files. You can be the first to write a review of Pavtube Video Converter for Mac!